My wife and I understand very well the grief one experiences when learning the awful truth that one’s child has a birth defect. We know how this can transform one’s life, with doctor’s appointments, surgeries, and uncertainties. But the Joy surpasses all this. You are here because I wanted to make myself more widely available to the pro-life community as a speaker and author. I have already been speaking around the country and in fact have been asked to speak at the national Lutherans for Life conference this summer. I would invite you to learn more about me and my ministry and my family and hope to hear from you soon. I would love to speak at your church, school, college, or organization. You may contact me at author@wechoselife.com. I would also be most appreciative if you could donate to my non-profit (but not tax exempt) ministry to help defray the costs of the ad that brought you to me. Start at the beginning by going to the We Chose Life home page. 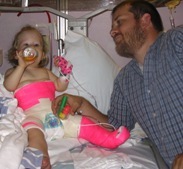 Check out my wife’s blog where she posts updates about our daughter and her condition. Below are three videos that I have. I have lots of tape of my presentations but it takes time to get them ready for the Internet! The first is just 5 minutes and gives an overview of my views and some sampling of me speaking. The second is from a high school I presented at in 2009. The third is a bit off the subject… it’s a graduation speech I gave in 2005.